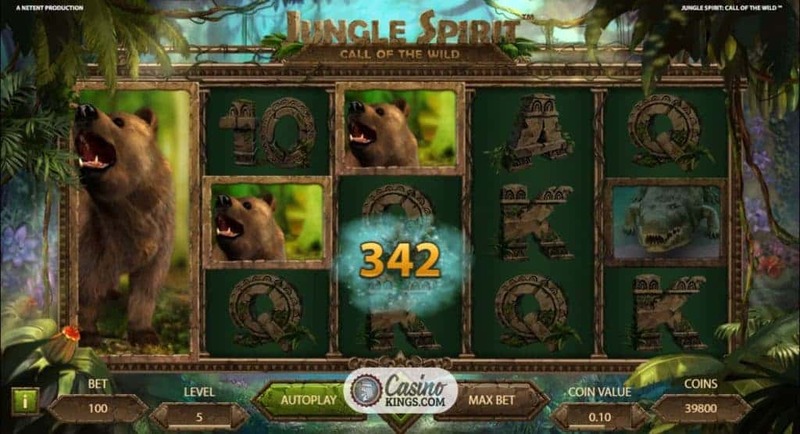 NetEnt knows a thing or two about jungle-themed online slots, having had serious success with jungle-based titles such as Gonzo’s Quest. 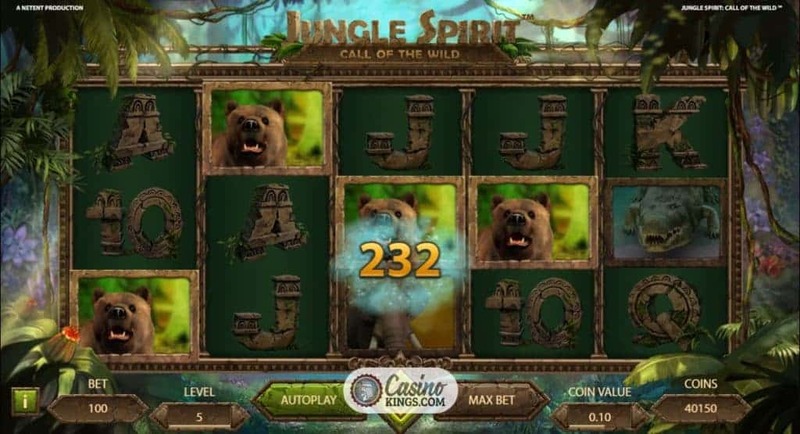 Jungle Spirit: Call of the Wild Slot is a five reel, 243 ways-to-win slot that boosts to 1024 ways during the bonus game. This is the only spoiler alert, for the atmosphere and artwork tells its own wild story that ensures we will have plenty of fun creating our own. NetEnt loves a good intro, though the studio has paired it down somewhat in Jungle Spirit: Call of the Wild. 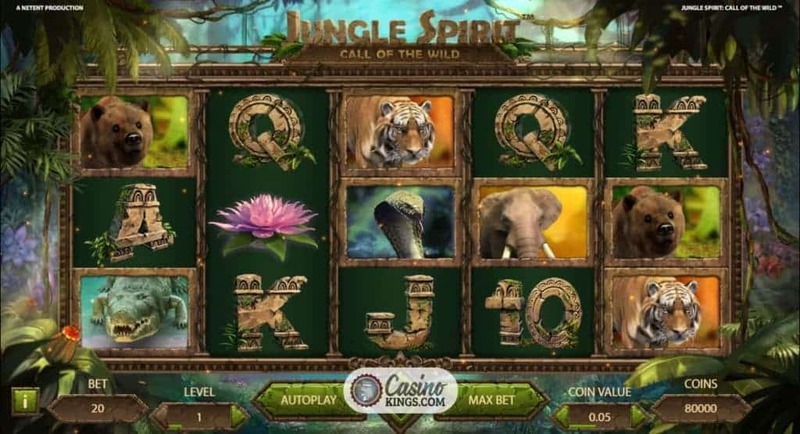 Instead, we are straight into the action, greeted by a shuddering Tiger’s roar and the information summary pages of this slot’s key gameplay features. We can read these through, or we can shut them down and get tearing straight into the jungle action. The choice is yours. As we’d expect from a super studio like NetEnt, the sound score and artwork is incredible. 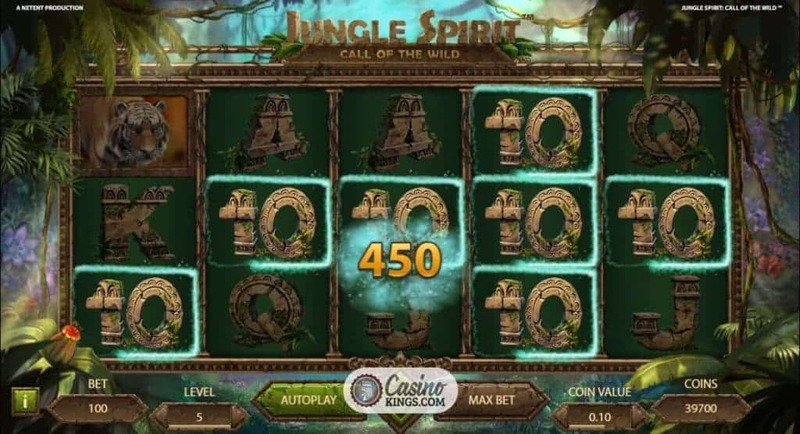 A jungle beat with ominous bass notes accompanies our gaming action, while fireflies flit in and around the reels to bring the 3D slots element to life. Our game symbols are the key characters in this jungle adventure. 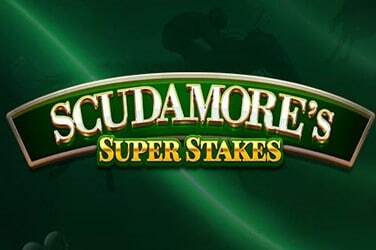 Our medium-paying symbols are Tiger, Elephant, Bear, Crocodile and Cobra, each bringing its own terrifying animation when it take spart in winning combinations. Stone-carved 10s through Aces make up our low-payers. Why no high-payers? 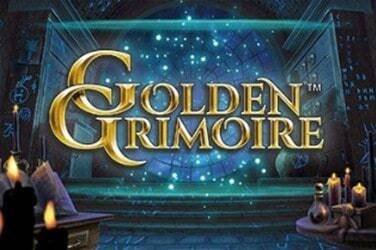 You may notice fluttering golden Butterflies accompanying some of our medium-paying symbols. Should these symbols form winning combos, these Butterflies expand the symbol to cover their entire reel/s in the Symbol Expansion feature. In such a hostile environment it is both incredible and fitting that it is the Butterfly that brings verve to the gameplay. Not only so in the Symbol Expansion feature, but also in the randomly-triggered Butterfly Boost feature. The golden Butterflies flit around symbols that form winning combinations, expanding 1-3 symbols across the entire reel/s and thereby boosting our base game win potential. 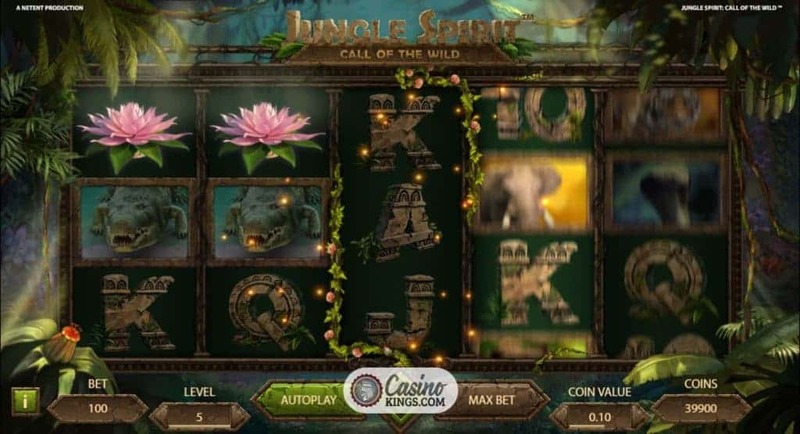 The Lotus Flower brings added beauty to the Jungle Spirit reels, and added wins to our e-wallets. 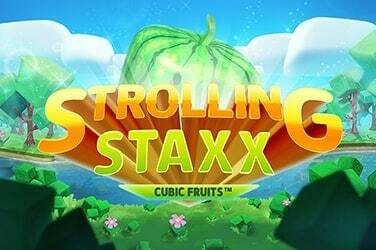 Landing three, four or five Lotus Scatters triggers the Free Spins feature, which will see our reels expand to four rows and now offer 1024 ways-to-win. But first we must choose a medium symbol as our dominant game symbol, each of which offers a different number of free spins along with it. 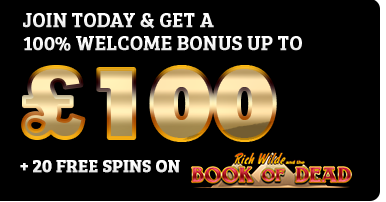 Surely we would go for the Cobra, offering 20 free spins rather than the Tiger, which grants 4 free spins? It depends on the risks we are willing to take in our jungle adventure. 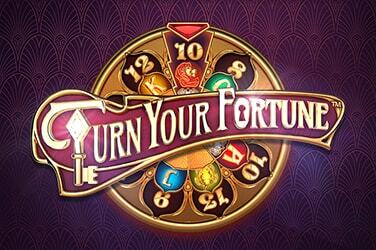 Symbols with fewer free spins come with higher risk, but also higher win potential. The opposite is true of those symbols that offer more free games. The choice is ours, and we must choose wisely. 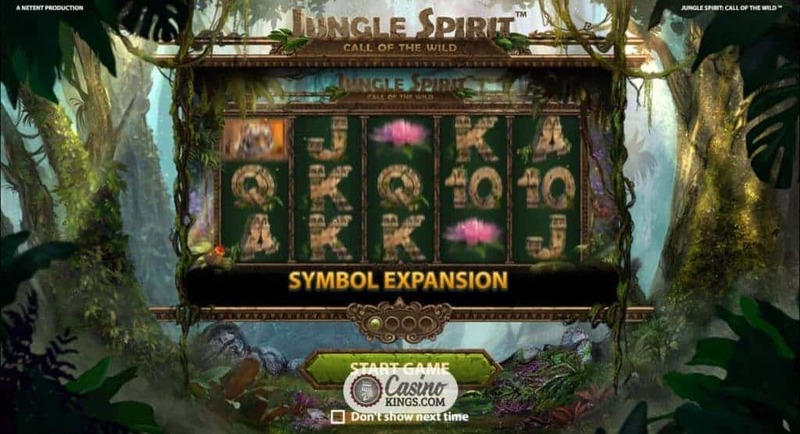 The animation, artwork and atmosphere in Jungle Spirit is first class, while the in-game bonuses make the base game playable and entertaining. NetEnt’s variation during the bonus game not only involves us in the adventure, but also allows greater exploration of the game and adds depth to this release. Straight out of the top drawer.